According to the principle of “Don’t make me think” a questionnaire should be as simple and easy as possible. Not only will your participants benefit from a well-structured survey: Response rate might increase and that is great for you too. The use of logical workflows (skip logic) avoids that participants need to answer irrelevant questions. E.g. when you ask in a questionnaire if the participant owns a car and he answers “no”, one should not be asked for the colour of his car in the next question. Logical workflows help to skip irrelevant questions on the basis of previously given responses. This feature can be used for closed questions with single selection. 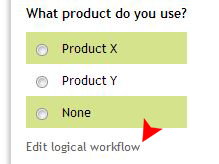 At a given question just click on “Edit logical workflow” and add a redirection rule according to your needs. Thereby you can make sure that only relevant questions are shown to the participant based on their previously given answers. In this example no specific redirection is defined for the responding possibility “Product X”. Therefore, all participants who choose “Product X” will continue with the next page of the questionnaire as normal. 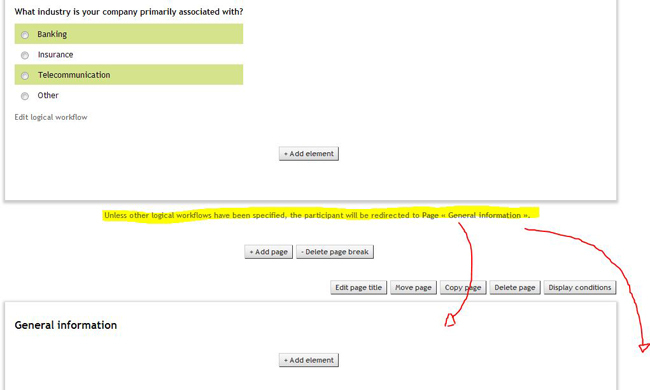 By choosing “Product Y” participants will be redirected to “Page 3”. “Page 2” will be automatically skipped. If somebody selects “None” he/she will automatically get to the end of the survey, as he/she does not belong to the target group. Beneath every page (assuming that you have more than one page in your questionnaire) you’ll find the same functionality as above, with the slight difference, that they refer to the page and not to given answers. Those “Site-redirections” will only be executed if no other logical workflows are defined within the same page (on questions). A well-conceived questionnaire guides a participant through a survey, without showing him irrelevant questions. Please remember that the questionnaire needs to be separated into several pages before the redirections can be used. “Display conditions” are useful as well to define such redirections. Posted on December 28, 2013 March 26, 2014 Author Pascal SchenkCategories What's New?